Once all the animals are fed and the greenhouse harvest list is checked off, I look outside at the fields and I can only imagine what it will be like in a couple months. It's still the calm before the storm at the HerbFarm. It's the tender game of waiting now and wondering if it will it freeze again. In the mean time- there is always something that needs weeding. I'm enjoying the routines at the farm. I love the fat hens, the ladies elite, with their posh chicken trailer now in the tall grass. 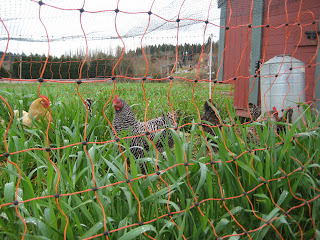 Since the fields have dried up a bit, Bill moved them from a higher area that they picked clean, to an area of lush grass that is taller than most of the hens. The teenage chicks however are still in their nursery, growing before my eyes. It won’t be long before they will join the hens and enter into a new pecking order. I've been studying the greens at the HerbFarm. I think about the wimpy leaves in the bags of salad that are readily available in grocery stores. The greens at the HerbFarm are of such quality- perhaps because they were made with so much care? Perhaps it’s simply the varieties that are grown? Likely, it is because of what they are not- mass produced. 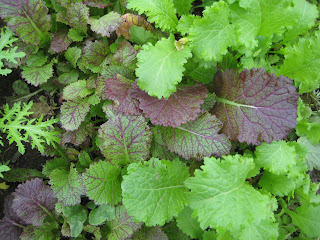 The purple leaves below in this picture are the Ho Mi Zi and the ruffled bright green leaves are called Green Wave mustard greens. The ideal cut for the restaurant is about two-three inches, and any taller then it's considered too old. The main reason is that some of the characteristics of the greens change as the greens mature; arugula for example gets spicier as well as nuttier as it gets bigger and older. Depending on the flavors needed on the menu, stronger flavored greens could really change an entire dish. 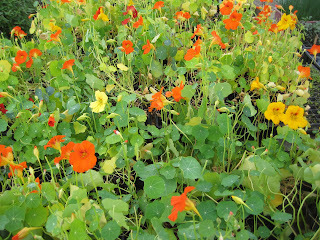 Part of the greenhouse harvest list is picking nasturtiums. They are absolutely gorgeous right now. Bright yellow, orange and reds. The restaurant uses their leaves for salads and garnishes but they also juice the petals- which I find fascinating. Every once in awhile while I am picking nasturtiums I just pop an entire flower into my mouth. Feathery-light petals melt a light perfume, the stamen is honey-sweet and then the stem is spicy hot like a radish. I’ve been waiting for Bill to post a menu up in the greenhouse so I can follow or guess where each ingredient is being used in which dish. As a cook, my question about each herb, plant and vegetable is “how” are they using it in the kitchen, not just “is this the size and shape you are looking for in a harvestable burdock root," for example. So far I think one true separation I have from some farmers/gardeners that strive to produce the best product possible is that it ends with the product being sold to a customer. Like, "here is the juiciest apple"-Whereas I am also the customer, the user who is going to take that product, the apple and create an entirely new product, completely transformed and re-packaged. "The juiciest apple" is now an apple crisp, a chutney or sauce. Is it a fair question to ask if all commercial gardeners' and farmers' crops would be better if they were all great cooks?